Twenty years ago, I nearly witnessed a murder. The date was June 28, 1998, a dark, hot summer night in Pittsburgh. Ironically nicknamed The Igloo, it was a cold night in hell inside the Civic Center as Mark William Calaway beat Mick Foley to a pulp. This was the King of The Ring pay-per-view event, a Hell in a Cell match between The Undertaker and Mankind. This was the greatest wrestling match in the history of World Wrestling Entertainment. Yeah, you were expecting some sappy, sentimental goodbye in my final column for The Sheridan Press. I’ve had a running list of column and story ideas on my phone since I started at The Press four years ago. Toward the top of that last, something I’ve wanted to write about since I was first given the platform to do so, is this match. I’m telling you, this match was bananas. And what makes it even greater, as I re-watched it Tuesday night for the first time in years, is this was actually a pretty crappy match in terms of actual wrestling. It lasted about 20 minutes, and a good half that was spent with dudes laying on the mat like corpses. But don’t let anybody tell you professional wrestling is fake until they’ve watched this match. The thing these two 300-pound behemoths put themselves through that night in 1998 was as real — and crazy — as it gets. Some of you might not have any idea what I’m talking about. The Undertaker and Mankind are as foreign to you as pro rodeo cowboys were to me when I arrived in Sheridan. So I’m here to paint you beautiful pictures like the Van Gogh of WWE columnists. The match begins with Mankind, a chubby guy who wears a torn dress shirt, tie and Leatherface-esque mask, stumbling into the arena like a psychopath. Surrounding the ring is a giant cell — a cage made of chain link fence. Mankind, the dang maniac that he is, immediately climbs to the top of the cell, 16 feet above the concrete floor of the arena. Jerry “The King” Lawler, one of the best announcers in the business, calls the whole concept of the match “satanic.” He’s not wrong. Then enters The Undertaker, dressed in all black, mangy hair dangling over his face. He’s announced as being 6-foot-10, 300 pounds and born in Death Valley. He’s the Grim Reaper in Barry Bonds’ body. He immediately meets Mankind atop the cell. Then, BOOM! Like a minute into the match, after a handful of poorly crafted punches, The Undertaker tosses Mankind’s body off the two-story cell. Mankind smashes through an announcer’s table. Jim Ross, Lawler’s cohort and the greatest announcer in sports history, wastes no time diagnosing it as a homicide. Dozens of WWE aids, including Chairman Vince McMahon, come out to revive Mankind. In what seems like a 20-minute ordeal, Mankind is eventually wheeled from the area on a stretcher, perceivably deceased. Ross apologizes for the match being so short. I still haven’t taken a breath. 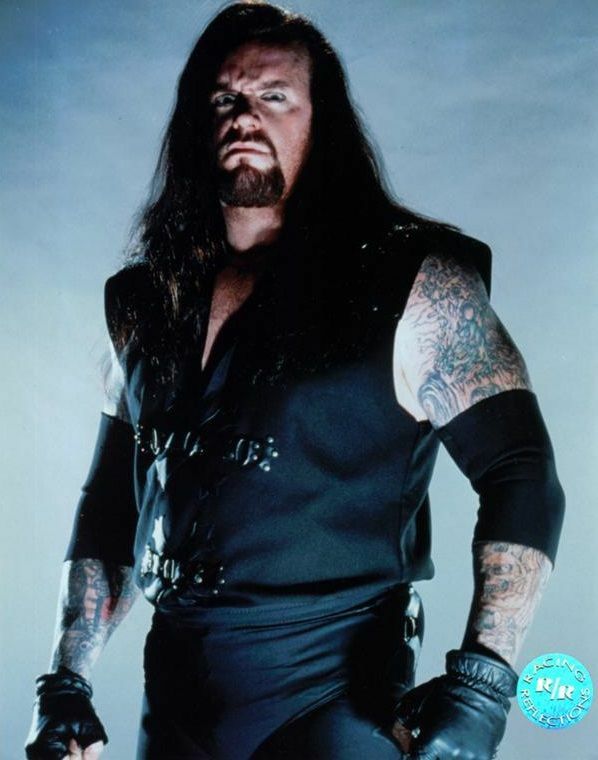 Then Mankind, the possessed madman that he is, jumps from the stretcher, stumbles back to the ring, climbs the cell and throws a few more punches at The Undertaker, who hasn’t left his spot perched atop the cell the entire time like Brandon Lee in “The Crow”. Within minutes, The Undertaker delivers his patented Choke Slam and throws Mankind through the chain link fencing atop the cell and onto the mat below. Concussion protocol was a bit more lax back in ‘98. “Enough is enough,” Ross pleads. The announcers were flabbergasted. As was 9-year-old Mike. As was 29-year-old Mike Tuesday. Indeed, this whole thing is satanic. Yet, we’re witnessing two wrestling gods put on a performance of a lifetime. Mankind then reaches under the ring and grabs a bag of some sort. It’s filled with thumb tacks! He dumps hundreds, maybe thousands, of tacks onto the mat. No! They’re not going to…they can’t! Somebody stop this madness! Once again, poor Mick Foley is on the wrong end of wrestling violence. One body drop onto the tacks isn’t enough; The Undertaker adds a Choke Slam to the fray — Mankind becomes a human pin cushion. At some point Mankind loses a tooth and it get lodged inside his own nose. I can’t make this stuff up. The Undertaker delivers his finishing move, the Tombstone Piledriver, once again slamming Foley’s cranium to the mat before a pin to win the match. Stone Cold Steve Austin, who would fight the final match of the night right after the Hell in a Cell match, recently said he and Kane, his opponent that night, had no chance to compete with show The Undertaker and Mankind had just put on. Mankind was later diagnosed with a concussion, although he even came back and interrupted the Stone Cold-Kane main event that same night. Stone Cold also said there were multiple times during the Hell in a Cell match when Mankind was inches away from serious head and spinal injuries. I’m one to believe Mankind had plenty of head injuries before agreeing to do these stunts. It was the greatest 20-minute stretch of sheer athleticism, grit, debauchery and psychosis I’ve ever seen. A perfect mix; an imperfect, yet beautiful, wrestling match. Hell hath no fury like The Undertaker and Mankind in a wrestling ring.